10 things I learned from David Moreno - Well- being Tips| Nutritionize! I had the opportunity to spend time and learn from expert international yoga teacher and cyclist David Moreno. 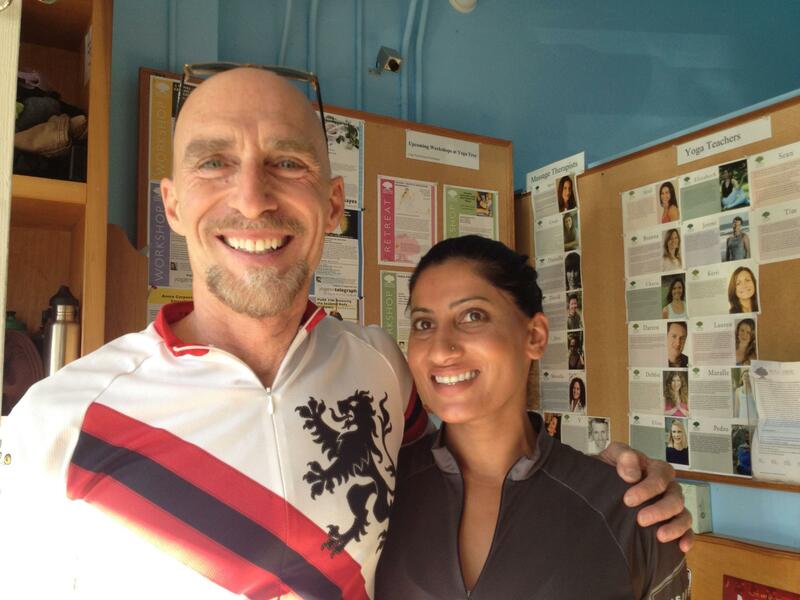 David was teaching a workshop titled “Yoga for Cyclists”, my two loves taught together, sign me up! You might be wondering how the two even go together; yoga belongs on the mat and cycling on the Tour de France. The beauty of Yoga is that it is EVERYWHERE and the practice truly comes alive when you take it off the mat and into the world. I can attest to that as I often credit my yoga practice to getting me through 7 days and 545 miles of cycling with the AIDS Lifecycle when my body was fatigued and my mind restless. David’s class didn’t start with rounds of sun salutations instead it started seated, focusing on the breath and checking in with the body. Regardless of what your sport is, if you’ve been doing for a while you probably have healed an injury or two and have experienced the nagging of an old injury. David’s class was all about giving these healing areas attention through body movement and breath. 1. Work the joints and the muscles will follow. We often spend so much time stretching and strengthening muscles and in the process neglect the ankles and wrists and knees and neck that do a lot of work. 2. Start with the feet and work up to the head. Start by rotating the feet, then the knees, then wrists and finish with the neck. 3. Skip the coffee and use a breathing practice like “Kapalabhati” to get the brain going. 4. Bring the shoulders up by the ears and then do neck rotations. Protects the neck. 5. Use a cooling breath post workout to bring the body temperature down. 7. Take 10 minutes when you return from the road to extend the powerhouses: Quads and Hammies, which are often overworked and under-loved. If you want to learn more about how Yoga can help your cycling or runs pick up one of David’s DVD’s. Embracing Yoga in this way has not only brought balance to my body but supported my “workouts” by providing a strong foundation of mind body connection. Whether I’m riding on a category 4 climb, lifting a heavy barbell, or healing a run injury I can count on my breath, body awareness, and resiliency cultivated through my practice to get me through it. So next time you prepare for a workout rather than sitting around waiting for the fun to begin opt take a few minutes to work in first.